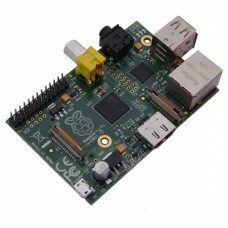 The Raspberry Pi Model B is a powerful low cost ARM microcontroller capable of running an embedded Linux operating system. It was originally developed by the Raspberry Pi Foundation to teach kids about programming and computer science. The board has plenty of features to enable advanced roboticists to use it in their robot projects. This small computer features a Broadcom BCM2835 "system on a chip" design with a ARM1176JZF-S processor. The processor runs at 700Mhz and has 512MB of RAM for maximum performance. A full set of ports is provided including Ethernet, two USB port, audio, composite video and HDMI digital video output. A GPIO header provides a set of 8 GPIOs, I2C, SPI and a UART which are important for building robot projects. The board contains an SD card reader and boots from an SD card. The SD card generally contains an Embedded Linux operating system and all of the user programs and data. The Model B board is more powerful than the Raspberry Pi Model A because it has twice as much memory, two USB ports and an Ethernet port. However, these extra features cause this board to use a bit more power. You might want to consider the Mode A board if your robot has a limited power budget.